Choosing a camera bag for me took a long time, as well as several purchases that were made only to be sold soon after. However, it’s been over 3 years using this Think Tank Retrospective 30, and I just can’t fault it. 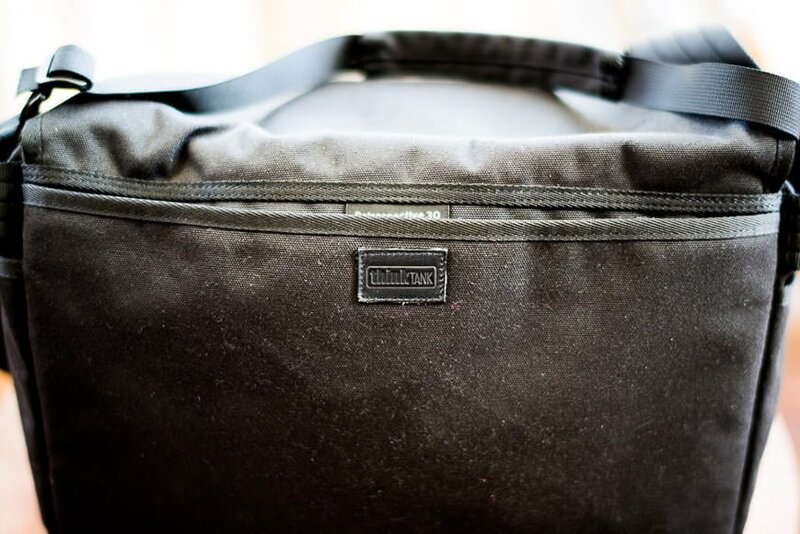 For me, the Think Tank Retrospective 30 is the perfect camera bag, and I whole heartedly recommend it to anyone who needs to carry a couple of bodies and a few lenses. I also think it’s the perfect camera bag for wedding photographers who need to carry a backup of every item of gear. My (20 week pregnant) girlfriend models the Think Tank Retrospective 30! 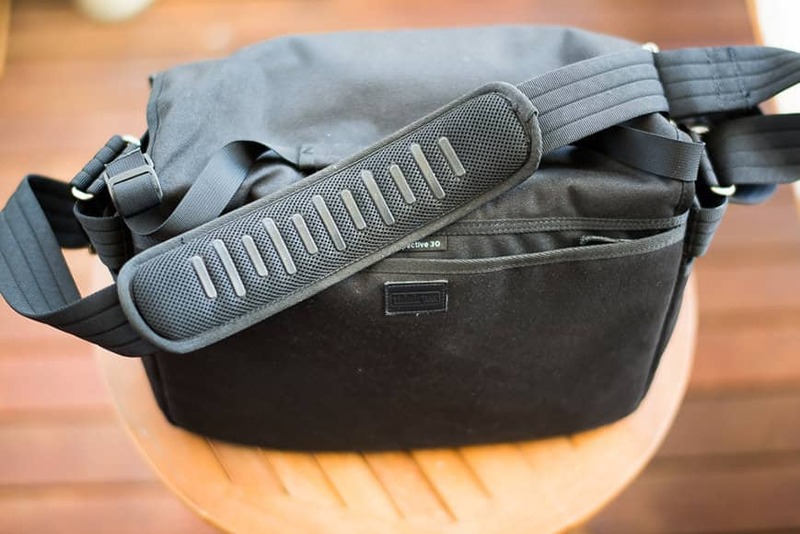 There’s not a great deal that can be said about a bag besides its looks, functionality and strength, so I’ve chosen to review the Think Tank Retrospective 30 by showing you what I carry in it everyday to shoots. This should give you a good idea about how much it can hold. There’s also a video at the end of this post. Aside from the fact that this bag is like the tardis, I love how its design means that it slips completely under the radar. It’s one of the few camera bags on the market that doesn’t scream I’M A CAMERA BAG FULL OF EXPENSIVE TOYS! !, and I’m grateful for the understated styling and lack of prominent logos. I’ve taken the Think Tank Retrospective 30 with me on hundreds of shoots in all kinds of conditions, and after 3 years it still looks brand new. This is testament to the high quality of Think Tank gear in general. 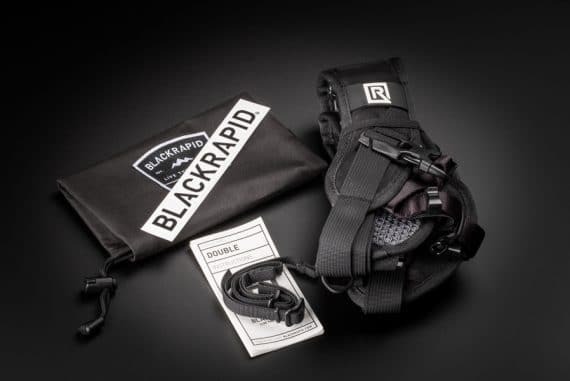 The grippy shoulder strap is well padded and built to last. 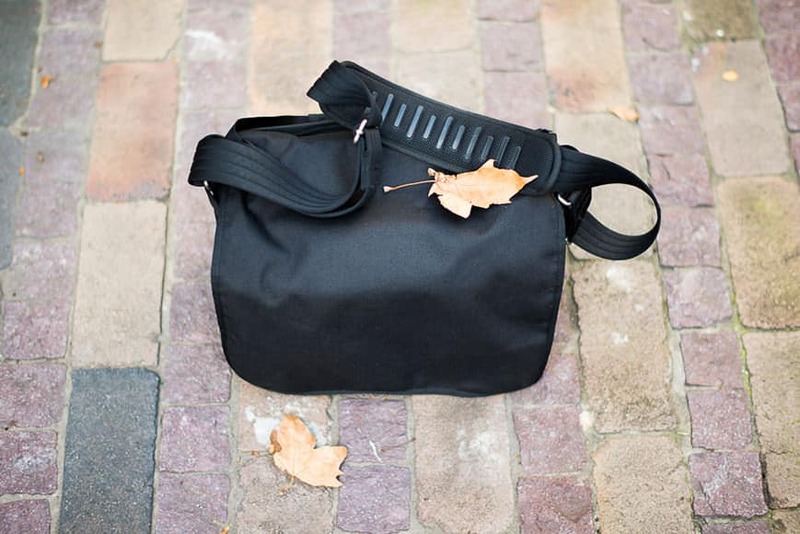 Details such as well placed heavy-duty loops for clipping extra gear, an outside and inside sleeve for documents or an iPad, an integrated light-weight waterproof cover and silencers for the velcro tabs all add up to a very well thought out bag. Velcro tabs can be covered with ‘silencers’, allowing silent opening of the bag, ideal for wedding photographers and those needing to operate unnoticed. Hi Chrissa! Glad you found the reviews helpful :-) Yes, I’m pretty sure you could fit all that in there. All the best! I’m looking into purchasing a camera bag (possibly this one) as a gift. 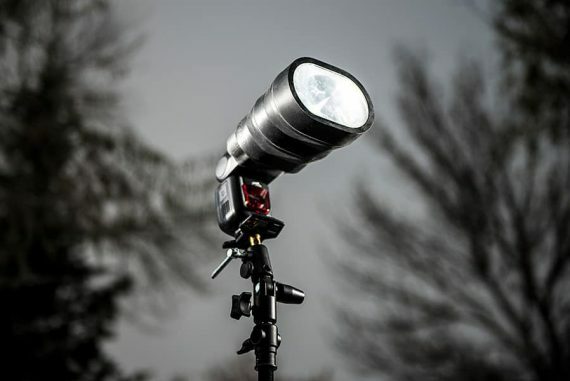 Would you recommend this for the avid traveler and outdoorsman? Definitely Lily. If it’s too big, just go for the 20 or 10 size. Very helpful written and video review. Much appreciated! Glad you found it useful Nina! Thanks for the comment. great site, awesome review! I already use two smaller ThinkTank Retrospective bags and I was shopping for a larger one when I stumbled upon your site. In the video you mentioned that you think a 13″ MacBook Air would fit inside. Can you confirm this, meanwhile? I ask because this information is very important for me. Otherwise I wouldn’t order the bag. Hi Thomas! I’m glad you found the review useful. It really is a great bag! 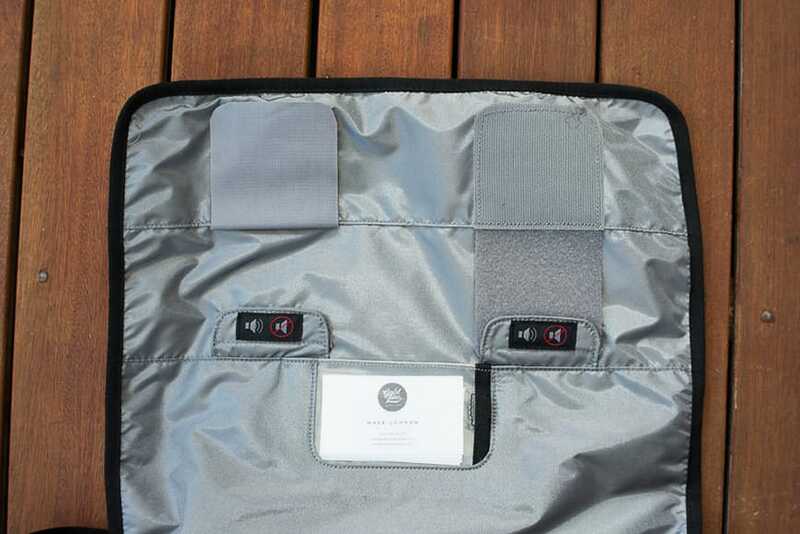 I just checked, and can confirm that a 13″ Macbook Air does fit in the inside pocket of the bag. It’s a bit of a tight fit though. If it’s convenient for you, please consider buying from either Amazon or B&H Photo to support these reviews. Cheers! Thank you so much for (double-)checking, Mark. Appreciate. Based on my location, I’m shopping on Amazon.de. Hope you’ll benefit anyway. I’ll try. Thank you for your cool review ! It is really useful. Awesome review Mark! 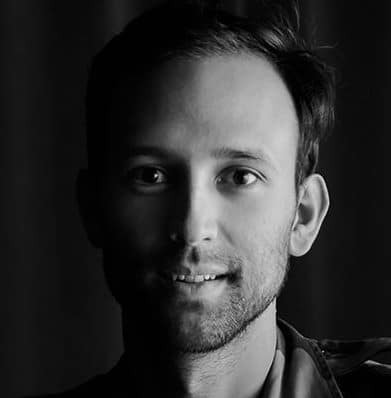 I just stumbled upon your site and it’s great. It’s going to cost me though, as I just purchased this bag after watching your review. Cheers for sharing! I’m undecided between this bag and the Lowepro pro messenger 200 aw, any advice? 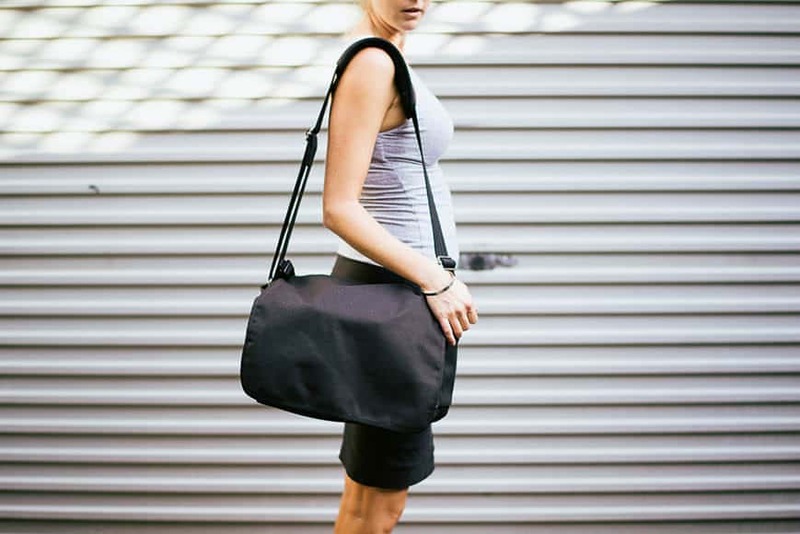 My friend has the Messenger and it’s a great bag – very similar to this one. However, I would still choose the Think Tank due to the larger front pockets, which I find really useful for carrying lenses etc. Hope that helps! Love the size, but carrying my gear in a shoulder bag for weddings are tough for me. I invested in the Think Tank Modular System so that everything sits on my waist/hips. I have a Think Tank Retrospective for going around with just a basic camera(less is more type of day) and that’s about all my shoulders can handle these days. Yeah, the waist/hips are a better place to carry the load for sure. 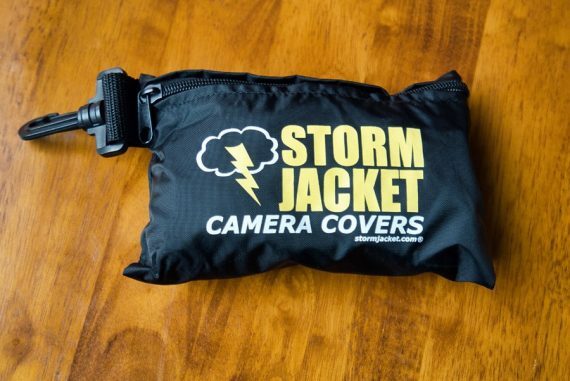 When I use this bag for weddings, I’m actually rarely ever carrying it – I put it down somewhere and then just carry the two camera bodies using my Holdfast Money Maker dual strap.